﻿ 85 & Vine - Ohio. Find It Here. A place to find a creative spark! 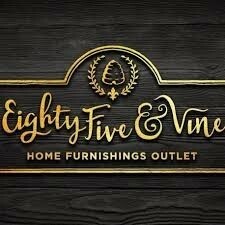 Furnishings that are unique and on trend, Gifts and Home Decor to make your house sparkle and a DIY corner filled with pieces that you can create. All nestled right here in SE Ohio.Formerly Woodyards, we have changed the entire atmosphere, our team is headed up by Carrie Napora, an Interior Designer, Artist and exceptional Visionary! (This comes from the Owner Patricia Rawlinson) (Carrie will be humble about this but its true all the same) If you are in need of some decor advice, need staging, or ready for a change, come in and talk with Carrie, she will get you off on the right foot!Our DIY corner is a Salvage center of antique windows, bunn feet, casters, hardwood furniture bits to craft benches, dog beds, home gates etc... Real wood table tops to make kitchen islands out of. Knobs, pulls, Glass... it is a veritable smorgasbord of DIY odds and ends that will get your pinterest juices flowing!We even have a few antiques... Frankly you just never know whats in store! Stop in and find your next treasure.